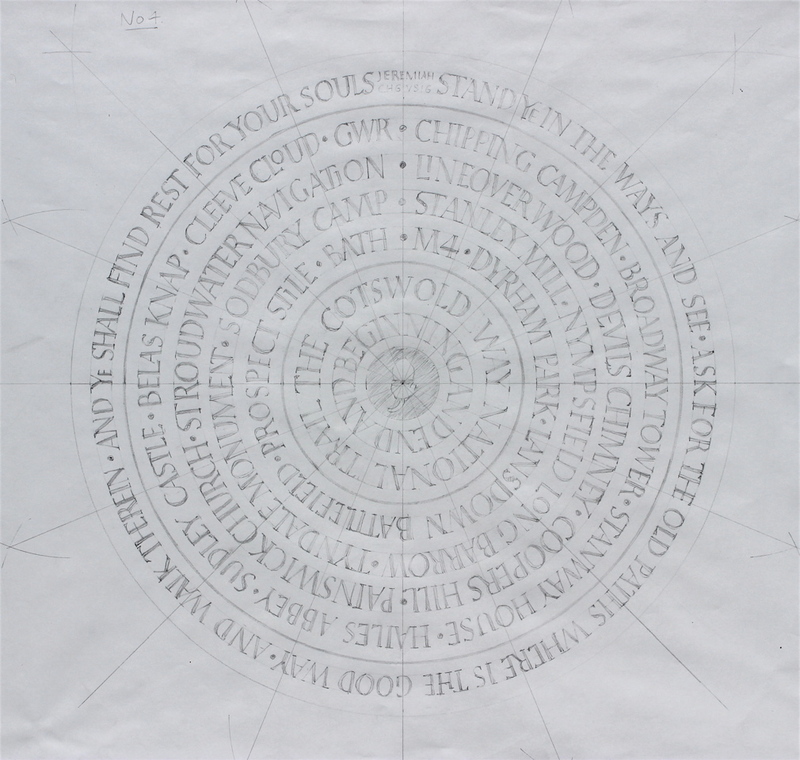 This entry was posted in Cotswold Way Marker, Drawing and tagged Cotswold Way Marker, drawing by iaincotton. Bookmark the permalink. An awesome drawing! How big is the stone? Have you chipped the first letter out yet? How did it feel? Thanks Barbara. The stone is 1.4 m in diameter and 8cm thick, and weighs around 400kg. This drawing is on A2 layout paper. There is enough detail to give me what i want, which information about the letter spacing. A lot of the lines are “oversubscribed” with letters so the question is, how do I make them fit? One answer is to to make each letter narrower, so you create an alphabet of compressed forms. Another answer is to use ligatures (letters joined together), nesting letters, and small letters, to fit the words into the space. I have leaned towards the former with slightly compressed forms, but there are some ligatures and nesting letters too. When I have used these, I have chosen forms that don’t leap out too much. I am looking for “flow.” So my eye will run along a line without being interupted by something that doesn’t fit, or by a gap that is too big, and I am looking for an evenness of texture over the whole piece. As usual, simple is best. I’m not carving yet though. I am working on a full scale drawing to micro-tune the spacing. The little drawing points me in the right direction, but I need a full sized drawing to fine tune the spacing and the forms. This will be further refined when I transfer the letters onto the stone, and refined again when I carve. I will post some pictures of my big drawing soon.